Keep your cats happy and well-adjusted by stimulating their minds with these toys! Cat Dancer Deluxe Cat Toy Every cat loves a Cat Dancer! CATCH Interactive Cat Feeder Slows down a fast eater, and satisfies a cat's natural hunting instinct! Catnip Cyclone Cat Toy Comes with everything you need to entertain your kitty for hours! FroliCat Dart Duo Laser Cat Toy Because two lasers are better than one! Kitty Crinkle Sack If your cat loves to get inside paper bags, this is for you! Kitty Kong Makes your cat work for that snack! Kong Cat Wobbler Helps fight boredom and obesity! Mouse in the House Cat Toy Can't be home to play with your cats? This toy will do it for you! Mouse in the House Replacement Mice Naturally, you'll need these! Slimcat Pack of 16 in Assorted Colors Save over buying individually! Tubby Tonkinese? Bored Birman? This may help them both! Thrill of the Chase Cat Toy With RealMouse sound and catnip! Turbo Catnip Hurricane Cat Toy Two track balls and catnip? Your cats will never leave this alone! Turbo Track Cat Toy Bored kitty? This gives you lots of options to entertain him! Turboscratcher Cat Grass Insert Fits the Star Chaser and Turboscratcher toys! When we don't have a direct supplier, sometimes Old Maid Cat Lady makes products available to you through affiliated retailers. Clicking on the ads shown below will take you away from Old Maid Cat Lady and to their stores. Affiliates pay us a small percentage of your purchase there for referring you. Be aware that Old Maid Cat Lady gift and discount codes do not work on other retailers' sites. Nor does any percentage of your purchases there go to our Cat Champions of the Week. If you choose to visit any of our affiliates, we hope you'll return soon to Old Maid Cat Lady! 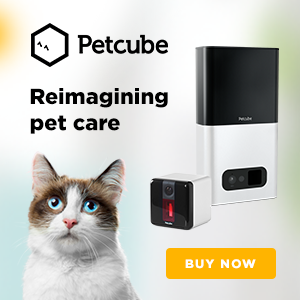 Click on the ad above to leave Old Maid Cat Lady and buy the Petcube. Why Enrich Your Cat's Environment? It's a common myth that cats sleep all day while you're gone. Cats are actually highly intelligent and need mental stimulation to be happy. A bored cat can become destructive, and you certainly don't want that! By providing items in their environment that help them do these things, you'll be keeping them healthier. One of my cats, for example, likes to knock his crunchies out of the bowl and chase them around the kitchen floor before eating them. He's exhibiting normal feline hunting behavior in doing this. It expends energy and helps him keep fit. And it's awfully fun to watch, as well! He may be an ideal candidate for a treat dispensing toy. Jackson Galaxy talks a lot about this on his "My Cat From Hell" TV show. As he helps his clients change the behavior of cats they think are misbehaving, his term is to catify their homes, making them friendlier places for their cats. While it's not essential that you line all your walls with cat walks, you do need to provide some places specifically designed for your cats to get up off the floor, to hide, and to play safely. Train your cats on where they're supposed to play, and which places are not a kitty place. Move kitty's toys around some from time to time so they're constantly facing a new challenge; some modular cat play systems are specifically designed to do this. Enriching your cats' environment will not only make them happier, you'll also be happier that they're not destroying your furniture and knocking Grandma's vase off the shelves to test gravity! • Balls for CatsCat-safe balls for kitties to bat around as they chase and play. • Catnip & Prey Toys for CatsCats learn to hunt while still kittens, and never lose this urge to pursue "prey". We have all the mice, squirrels, chipmunks, and other prey toys to keep your cats happily hunting all day, many with catnip to drive your kitties wild! 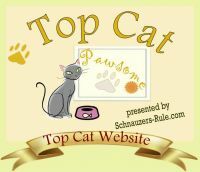 • Dangling Toys for CatsCats love to chase a string or dangling toy! We have them all here, both for interactive and for self play. • Environmental Enrichment for CatsYou can't be there every hour of the day to play with your cat...but you can make kitty's day less boring when you're not home, with environmentally enriching toys! • Interactive Cat ToysToys to help you interact with your cat through play. Your kitty wants you to play! It's healthy for both of you.